The Panther Moon Slot from playtech has an eerie forest setting which is rather exciting. 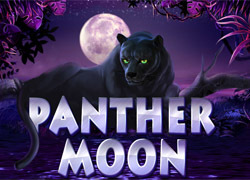 The Panther Moon slot has 5 reels with 15 paylines and added features of a Multiplier and Gamble. Panther Moon has a mean looking Panther and a full moon over a lake as the main symbols. The Panther is the Wild; it substitutes and doubles the wins of all symbols except the Scatter. The Scatter ( the full moon ) gives 15 free games along with a triple multiplier and more free games can be won during the feature. 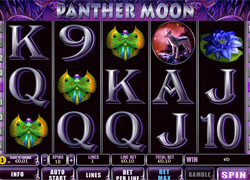 The other symbols in the Panther Moon slots are fellow creatures of the night and exotic blooms! There is a jackal baying at the full moon, an owl, a shimmering moth, a blue lotus and a wild red insect eating flower! When the Wild is substituting another symbol it doubles the payout of that symbol. The thrill and excitement of a slots game is doubled with the mystique of the Panther Moon, which can be fully appreciated in the silent and dark hours!